Our product range includes a wide range of cotton anarkali suit, anarkali suit, fancy ladies embroidery suit, anarkali ladies suit, designer anarkali suit and fancy anarkali suit. 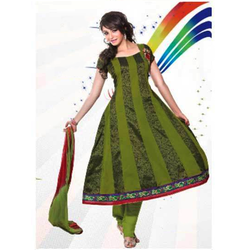 Being one of the reputed organizations in the market we are engaged in offering an exclusive range of Cotton Anarkali Suit. In tune with the latest standards of fashion industry, our offered suit is beautifully designed by our creative designers using premium quality fabric and modern stitching machines. In order to ensure its flawlessness at clients' end, our provided suit is rigorously checked against various quality parameters. Our reputable clients can avail this suit from us at pocket friendly prices. The offered Anarkali Ladies Suits are tailored making use of the best quality fabrics that are obtained from certified sources of the market in total compliance with the defined industrial standards. These products are available in assorted colors, designs & prints in order to meet the varied demands of customers. These products are available in assorted specifications and can also be easily customized as accomplish the huge demands of the customers. The offered Fancy Ladies Embroidery Suit is tailored using high quality fabric that is procured from reliable sources of the industry in compliance with defined industry norm. 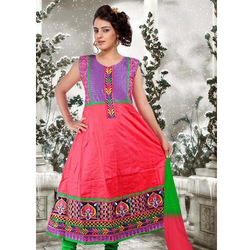 Our renowned company is involved in the domain of offering the best quality assortment of Anarkali Ladies Suits. Our offered products are precisely developed & designed with greater quality texture in conformity to the global superiority ethics. Offered products are designed & stitched with the assistance of our expert designers. These products can be tailored to meet the assorted needs of the customers. Honored patrons can get the offered products from us at industry leading rates. In order to comprehend and meet the diverse demands of clients, we are able to offer an extensive array ofDesigner Anarkali Suit. The offered Fancy Anarkali Suit is tailored using high quality fabric that is procured from reliable sources of the industry in compliance with defined industry norm.